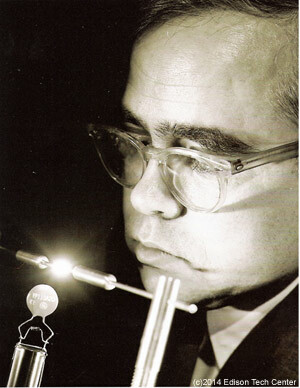 John D. Harnden Jr. worked at the General Electric Research Lab and developed many technologies. He led breakthroughs in the semiconductor field, electric lighting, power conditioning and more. He has a wide knowledge and respect for the legacy of engineering and founded the Edison Tech Center (Edison Exploratorium) in 2001. Mr. Harnden has a unique understanding of physics, materials and electromagnetic forces combined with a love of tinkering and design. Engineering has been a passionate pursuit of John's for many years and it is embodied in the non-profit he founded. See more about Edison Tech Center here. John worked with William G. Morris and Francois Martzloff working on the Tyristor and Zener Diode and eventually this led to the team developing the metal oxide varistor (MOV). The GEMOV surge suppressor was perfected in 1973 and first sold in 1976. This revolutionized power conditioning at a time when computers and semiconductors were getting damaged by the uncontrolled variable voltage levels in the grid. The MOV is used in all kinds of electronics today and is a vital form of power conditioning, in other words it controls and changes electricity to work at precise parameters needed for a given device. History of Arresters on Power Systems 1965-Present by Jonathan J. Woodworth. John Harnden developed switches and other power control devices which improved a myriad of technologies from home appliances to mega machines at steel mills. In 1968 and 1971 he developed a static electronic photoflash assembly and a disposable flashbulb lamp with William Kornrumpf. John also developed precise timing devices using semiconductors which allowed the flash to go off at precisely the same moment as a high-speed shutter. His work on semiconductor switches also was applied to electric signs. Mr. Harnden also worked with William Kornrumpf, James Kohl and Michael Adler on piezoelectric switches to replace electromechanical and solid state switches in the telephone industry. The piezoelectric switches were better in that they were more robust than solid state (silicon), and faster than electromechanical switches. The piezoelectral switch could be tuned to allow precise frequencies through and filter out other unwanted frequencies. The new switches were very small and could be easily deployed in the field. Older switching required larger apparatus and infrastructure to protect it from weather. John's team worked on many types of piezoelectric switches and rushed to design useful applications of the switch to improve all sorts of devices. For use of Edison Tech Center images and videos see our licensing agreement.